Hi lovelies, it is going to be a busy week as my uni-mate aka my 'sister' is out in Penang for her exam and we are going to meet up! Apart from that, I just went to Lost World of Tambun, this was a short getaway and I shall post what I experienced during that short trip over here real soon, like if you want to know. Before that, I'm going to share another event that is held at Penang right now (basically this whole month of August) - Gerge Town Festival 2014. George Town Festival is a month-long festival that has turn into a proudly Penang arts institution, I googled it. So, you can enjoy those arty stuff in this month such as films, dance, music, photography, theatre, workshop and etc. Still not sure/don't know what is all about? Just visit their website, you can know what is it all about and you might find something caught your attention when you browse through their programmes list. Before the GTF 2014 started, Penangites might noticed that the organizer were setting up a #GTFWORDS campaign to get people hunting for the alphabets. I found some, the rest were too far and I was too lazy to walk under the hot sun to get all alphabets in the heritage areas; it means I didn't win myself a pair of entrance ticket to those films/music performances. Now, the campaign is ended, if you are wondering where they keep the alphabet, you may just go to Dewan Sri Pinang, they have all the alphabets there lining up as "George Town Festival 2014". I can skip those performances as I'm not 'art' enough to understand that, but I can't skip the workshop and one of it that I participate is "Binding & Weaving Pages of History" workshop. 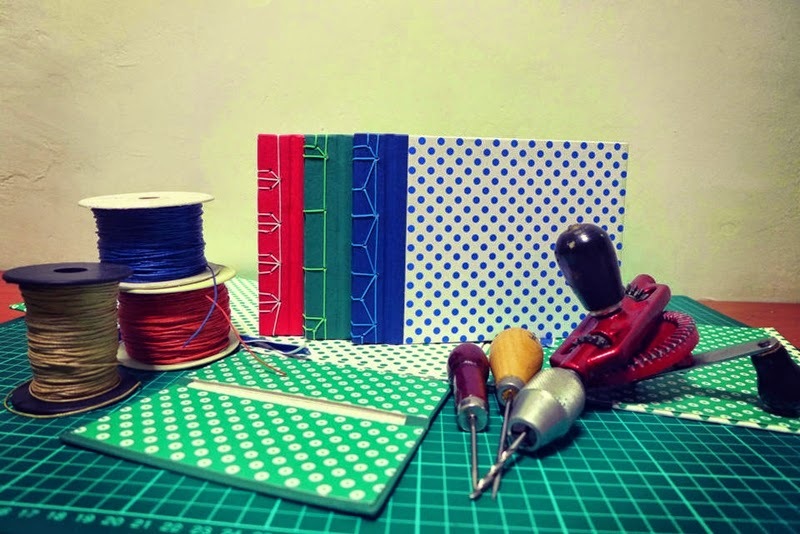 From here, we can know how to weave our handmade books with Japanese stab binding or long & link stitch binding. Sound fun? If you are interested on this, please visit here and you will know how to register yourself in this workshop held on 29/Aug and 30/Aug. Hope to see you there in the workshop!